Bihar Police SI Marks / Score Card Check Here. Bihar Police SI Final Result Check Here. Bihar Police SI PET Admit Card 2018 Check Here. Bihar Police SI Admit Card 2018. Bihar Police Notification is out. Bihar Police is recruiting for 1717 Sub Inspector's 2018 Final Posts. You can check Bihar Police last date, download Bihar Police notification, visit Bihar Police official website and check other Bihar Police Vacancy details.Complete Vacancy and recruitment Details about 1717 Sub Inspector's 2018 Final vacancies in Bihar Police are provided below by JobSarkari.Com only for you. 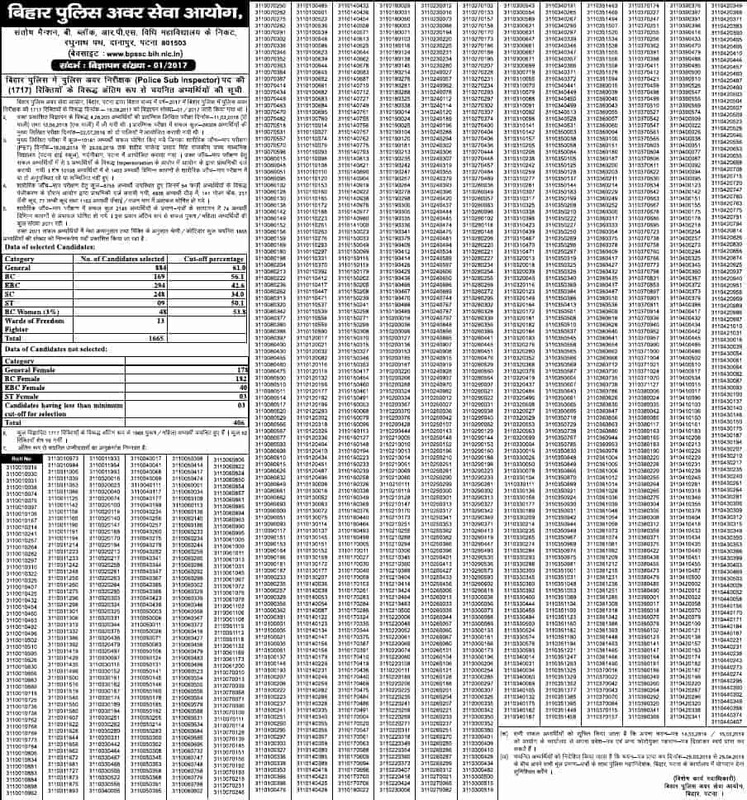 Advt Date – 16/09/2017. Application Began – 24/10/2017. Last Date to Apply Online – 30/11/2017. Gen / OBC- 700 /-. SC / ST – 400 /-. Candidate deposited application fee through Net Banking/ Debit card. Post 1 – Sub -Inspector. Total Posts : 1717. Graduation . (Check the Notification to get detailed information about post wise Qualifications.). Age as on 01/01/2017. Minimum – 20 Years. Maximum – 40 Years. Selection May be Based on. 1. Written Test Pre. 2. Written Test Mains. 3. PET. The Candidates can apply through Online mode. Online application will be available till 30th November, 2017. Download Notification – Click Here. Apply Online – Click Here. Official Website – Click Here. Q. What is the Last Date For Bihar Police Sub Inspector's 2018 Final Vacancy ? A. Last Date for Bihar Police Sub Inspector's 2018 Final Posts is 30/11/2017..
Q. What is the Form Type of Bihar Police Sub Inspector's 2018 Final Recruitment ? A. The Form Type for Bihar Police Sub Inspector's 2018 Final Posts is Online. Q. How many vacancies are available in Sub Inspector's 2018 Final Posts ? A. There are about 2000 Vacancies in Sub Inspector's 2018 Final Posts. A. Full Form of Bihar Police is .